New York Red Bulls 'keeper Ryan Meara joined the Ireland team for training yesterday and it could open the door for future involvement in Martin O'Neill's plans. Ireland have been preparing for tonight's game with Portugal at Red Bulls' base and that created the opportunity for 23-year-old Meara to join in for a session which was also watched by former Scotland boss Andy Roxburgh, the MLS side's sporting director. Meara, who hails from the Irish community in Yonkers, expressed an interest in declaring back in 2012 when he broke through to become their first-choice 'keeper. However, he has since lost his place in the side to Arizona native Luis Robles. The ginger-haired netminder was called into Noel King's U-21 squad two years ago – with King calling MLS-based Robbie Keane for a reference – but had to refuse the call-up due to club commitments amid reported interest from the US. He trained with Charlton last November and O'Neill says he will keep an eye on his progress while stressing it would be too soon for him to deliver a verdict on his capabilities. "We'd heard about him. Steve Guppy (coach) had mentioned the fact. 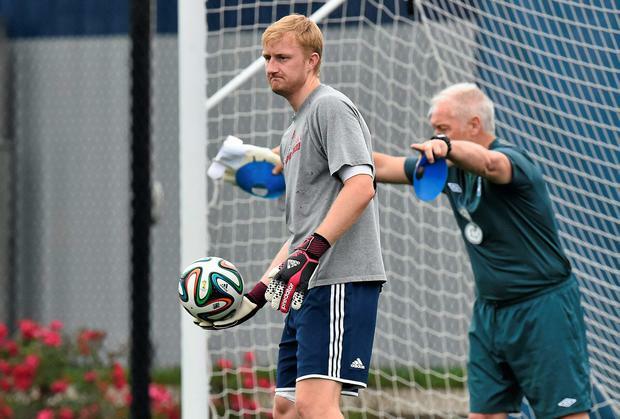 Steve keeps an eye on the MLS and Seamus McDonagh (goalkeeping coach) had known about him," said O'Neill. "We thought it was an opportunity and he came and trained with us. He's going to come to our game tomorrow night with his grandfather so we'll keep an eye on things. "You wouldn't dismiss it anyway," continued O'Neill, when asked of his long term prospects. "I wouldn't think we're in a position to do that. "You know what? I'd obviously need to see more of a him. It would be hard to make a judgment on a 15-minute game in one training session."